Let’s face it…Self control isn’t infinite and if you feel deprived on a regular basis, eventually you are going to binge. 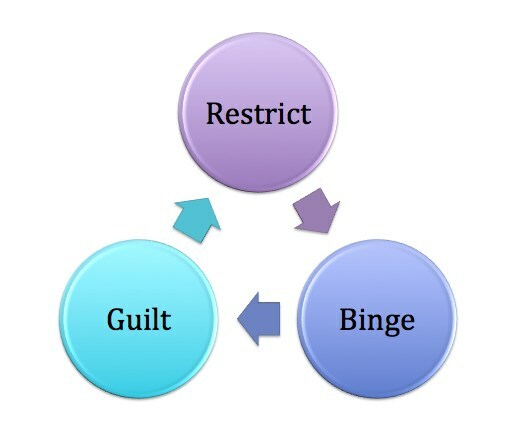 And then that binge usually leads to guilt, which in turn leads to another binge and then guilt….and then potentially another binge until you finally go back to restricting what you eat. But you can’t eat healthily and eat exactly what you want all the time. You simply can’t eat burritos and frozen yogurt every night no matter how good it tastes. So if you can’t eat exactly what you want any time you want it, but you also can’t deprive yourself of the food you love, what the heck do you do if you want to be healthy? You don’t restrict yourself…Or at least you do so as little as possible. I’ve mentioned this before, but when making diet changes, you really have two options – go all in or make small changes. Which one you do is really dependent on you. For some people, it is best to go all in at the beginning because any temptation at the beginning away from the clean eating habits they want to instill will lead to a binge. For others, “going all in” leads to feelings of deprivation, which in turn leads to binging. So when starting to make healthier choices, you need to decide which one will work best for you. Then you also need to figure out what triggers your feelings of deprivation. What makes you feel like you are restricted and can’t indulge? Is it not having dessert at night? Is it that you miss that salty snack in the afternoon? Is it when you get stressed and just want to eat? Once you figure out your triggers, you can PLAN for them. You can have healthy alternatives on hand when you know you may need them. Like for me…I grew up eating dessert every night so when I’m stressed or tired or just not in the right frame of mind, I start craving dessert. But instead of completely depriving myself, I’ve found healthy alternatives that satisfy me. Like a piece of dark chocolate or some delicious fresh fruit. And honestly for me this works because I physically feel way better and SATISFIED. It’s not that a pint of ice cream doesn’t still sometimes sound good, but for me most of the time it just isn’t worth it. I would rather my chocolate bar. Basically what you need to do is nip the craving in the bud. If you let that craving fester, you are doing to feel deprived and eventually not care what you eat and binge. If you just deal with the craving, you are going to be way better off. There are definitely times when you just really really want that cookie, that bag of chips, that snack that everyone else at the office is indulging in. And sometimes it is ok to give in. But if you indulge in that thing that you truly want, don’t allow it to be an excuse to binge. Indulging and enjoying things you love isn’t bad! If you stress about not being perfect with your diet, that stress is what will TRULY lead to binging. Because that stress is what makes you feel restricted and turns one little indulgence into a year-long binge. If you really want to eat well, you’ve got to realize healthy living is a LIFE-LONG PROCESS. It isn’t about perfection day in and day out. It is about trying to simply eat whole natural foods as often as you can while STILL enjoying life! So don’t stress yourself out about dieting. Don’t make yourself feel deprived and completely restricted. If you LOVE Thanksgiving food or Christmas food or have one restaurant you go to occasionally on a Friday night, indulge on that day! Don’t deprive yourself of things that you love! That one day, one meal isn’t going to destroy all your hard work! What will destroy your healthy lifestyle is stressing about the indulgence and NOT enjoying to the fullest! Feel satisfied when you indulge, not guilty, because satisfaction leads to adherence in the long run, which is what truly matters! So now the question is…Are you caught in the binge eating cycle? What do you do so that you ENJOY eating well and don’t feel deprived? Posted on June 10, 2013, in Diet, Mindset and tagged binge eating cycle, calorie restriction, Cheat Days, cravings, curbing cravings, diet restriction, Dieting. Bookmark the permalink. 6 Comments. Great tips! For me looking and feeling great all the time is all I need to enjoy eating well and not feeling deprived. I don’t look at it as I’m missing out, I look at it as others are missing out. Being fit feels so much better than anything tastes. Thanks! It is always a balance. Eating when you are stressed will only lead to more stress and guilt. I have no problem with indulging just make sure it is for the right reasons! If you cheat, enjoy it and then get back to eating well. That way you feel great and you got to indulge which makes it all worth it! I have to stop myself from binging on video games! I feel guilty for ages after I’ve played them, rather than working! As far as food is concerned, since I started following a mainly Paleo diet, I can eat as much as I want, when I want. You can even throw in some dark chocolate! Yup! Finding a diet where you don’t feel restricted makes everything good! You should feel like you get to eat great things and enough to satisfy you! Can’t say I understand the video game binging although I do occasionally watch too many chick flicks or do little shopping binges! Great post. The way I look at it is, I’m not training for a competion but I do have personal goals. So I like to live a balance lifestyle. Mostly lean meats, a lot of water, veggies and fruits. Everyone once in a while a burger or glass of wine. This way, I never feel deprived.